"When I look at a Judy Fuller painting, I find myself mentally in the scene and pretty soon I can hear the wind in the trees and the birds chirpping and feel the peace of being one with nature. 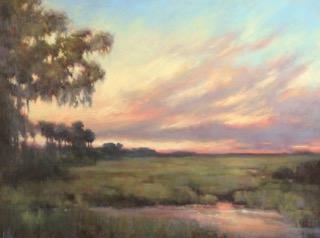 Many paint lowcountry or wetland art and do a great job, but I find that Judy is able to capture something else indefinable that is able to bring people into the painting. It is extraordinary. Drop by to see what I mean." 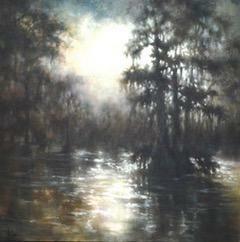 Aclaimed artist, Judy Fuller, shows exclusively in the Mary Martin Gallery in Charleston for the tri state area. 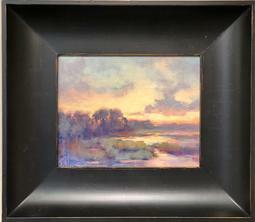 The photographs on this page do not show the luminosity of Judy's layered glazes. The paintings show a depth and brightness of color impossible to duplicate with photography. 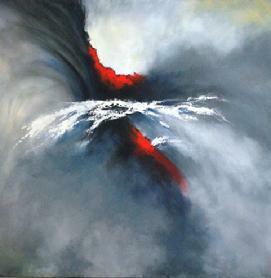 Drop by to view these beautiful renditions of the coastal areas in person. Judy is an Ojibwe American Indian (White Earth Reservation, Northwestern Minnesota) by heritage from her father's side and German from her mother's side. Judy's family movement from Minnesota to the California space industry is a story that is the true American dream. Her father became one of the notables in the space program by designing the first fuel cell used by NASA in the shuttle program. .
She is a native of San Diego, California, attended San Diego State University (prior to transfer to University of Miami). During her early business career, she began studying art through workshops and individual study in California. 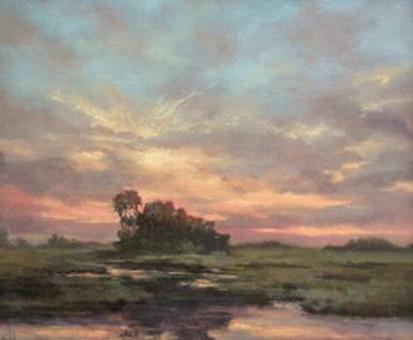 Relocating to Miami offered new artistic subjects with the expansive wetlands in the Florida Everglades. 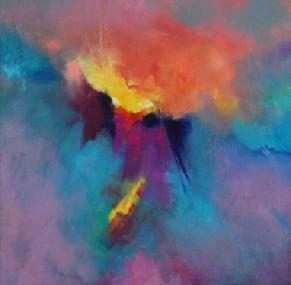 She continued to paint while finishing her under grad at the University of Miami and the University of Miami Law School. Following completion of her juris doctor degree, she continued her professional career as a General Magistrate in Miami, while raising her family and pursuing art. 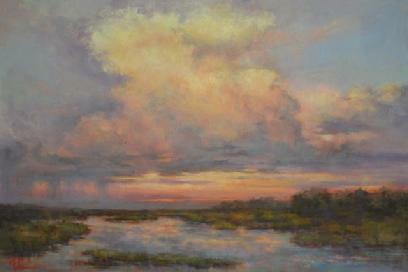 She had the wonderful privilege of painting with, and being personally mentored by, the late A.E. Backus, "Beanie," at his studio in Ft. Pierce, Florida. She now devotes full time to the continual pursuit of her artistic passion. As Ojibwe American Indian, Judy's art portrays that special love of nature. The influence in her work is that of the Tonalism movement of American painters of the 19th and 20th centuries. 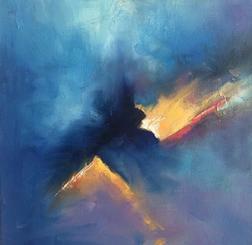 Capturing the sprit of the scene is premier to the development of each painting. Each finished piece is the product of layers of pigments and glazes. Countless hours of outdoor observations, sketching, photographing and plein air painting at special times of day are crucial to Judy's study of art. She is artistically challenged to reduce to a flat surface the vast beauty of God's design. 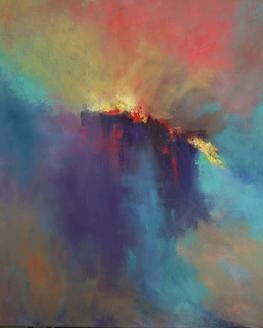 The result is a radiance from within that draws the viewer into the scene. The work takes the breath away. To describe my passion for art as totally consuming is an incredible understatement. I am drawn to the tonal aesthetic of American painters of the 19th and 20th Centuries. 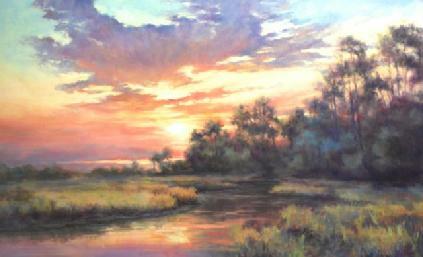 Capturing the spirit of the scene is premier to my development of a landscape wetlands painting. Each painting incorporates layers of translucent and transparent glazes. My search for interesting subject matter involves hours of outdoor observation, sketching and plein air painting oil at those special times of day - including moonlight and campfires. Many of the scenes are only accessable by boat which adds another dimension of rapidity to the artistic challenge. 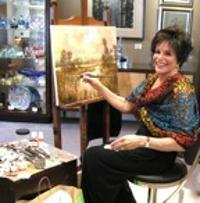 In addition to painting for myself, I also have taught privately and am an oil painting workshop instructor. The enthusiasm of creative artists is nearly as fulfilling as attempting to replicate God's designs with paint. 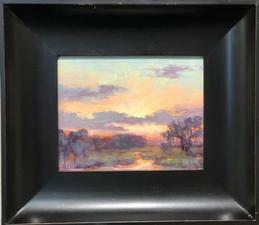 My art is representational, pure landscape, in the tonalistic style of 19th and 20th century artists, especially those of, or influenced by, the Hudson River School. Miami Florida was my home for most of my adult life and while I study artist, A. E. "Beanie" Backus, was the greatest artistic influence in my life. As an Ojibwe Indian (White Earth reservation, Northern Minnesota), it seems imperative to express my heritage in these Spirit Night Dancer stories. Each Sacred named character dances his or her story accompanying each painting. Sign in to be placed on a Judy Fuller alert list for new work.